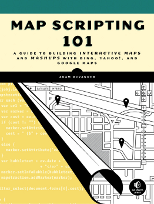 Which Maps API Should I Use? Google Maps is the mashup mainstay, but it’s not the only game in town. You may prefer the deep red color of Yahoo Maps freeways or the bird’s eye view in Microsoft Live Earth. My advice to those new to mapping is always the same: go with Mapstraction. It’s not an API itself, but a wrapper for about a dozen other mapping services. You can write once with Mapstraction and switch providers later on. Say you choose Google Maps now (and most of us do). Down the line if Google chooses to put ads on the map, for example, you’d be able to switch to Yahoo with minimal changes to the underlying code. There are some downsides to using Mapstraction. It is built to work with many providers, meaning that Mapstractions features can only be those shared by all mapping platforms. When Google releases a hip new feature, that might not be immediately available in Mapstraction. Nevertheless, for most common mapping projects, this won’t be an issue. Get started with Mapstraction by reading my Mapstraction tutorial at Webmonkey.